On 16th August, Apple CEO Steve Jobs delivered his keynote speech at the company's Worldwide Developers Conference (WWDC), announcing three anticipated products: Mac Pro, the Intel-based successor to the Power Mac; an Intel-based Xserve; and Mac OS X Leopard, the next major version of the Mac operating system. 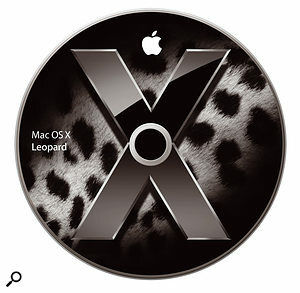 Mac OS X Leopard is the next major version of the Mac operating system, due to be released next spring. I'm not going to discuss the new Mac Pro much here, because a full review will appear in Sound On Sound very soon. However, with Apple choosing Intel's latest Xeon architecture for this machine, with two dual-core processors in every configuration and featuring a 1033MHz system buss with Fully Buffered memory running at 667MHz, the performance you can get from the new Mac Pro is quite incredible. While the exterior hasn't really changed from the Power Mac G5, the interior of the chassis is a huge improvement, offering space for up to four SATA drives and two optical drives. That you can now have 2TB of internal storage, not to mention that the drives are easy to swap out, is going to make a big difference for those who record and work with large amounts of audio. The Mac Pro is available now, in one standard format, for £1699, that can be configured to fit your requirements (and wallet) via the Apple Store. We've often discussed the potential of the Xserve for use in audio and music-related applications, and while some people have managed to use it, the full potential of Xserves in this field has never been fully realised. However, the new Intel-based Xserve (which will ship in October) may change this situation, partly because it's based on the same architecture as the Mac Pro, and partly because it now includes a built-in mini-DVI connector that's capable of driving either a DVI or VGA display, instead of requiring a PCI-based graphics card to be installed. In terms of expansion, the Xserve offers two eight-lane PCI Express slots, with the ability for one to be configured as a PCI-X slot. This latter option could be great for those who still have PCI-X-compatible audio cards, although what will be really interesting is to see whether you could use a new Xserve with Digidesign's latest PCI-Express-compatible expansion chassis, to run Pro Tools HD. Digidesign have announced that Pro Tools HD (along with LE and M-Powered versions) will be shipping with Mac Pro compatibility in September, so hopefully we'll be able to test this fairly soon. Shortly after the WWDC, I was fortunate enough to have the opportunity to sit down with Frank Casanova, Apple's Senior Director of Product Marketing for Interactive Media, who took me through the new Leopard features. As Jobs had already mentioned at WWDC, Apple are not announcing every Leopard feature just yet, so unfortunately we'll have to wait until next Spring, when Apple anticipate they'll be shipping the operating system, to find out exactly what the full release will offer. However, in the meantime there are plenty of features that have been announced that will have a big impact on the way musicians and audio engineers interact with their Macs. 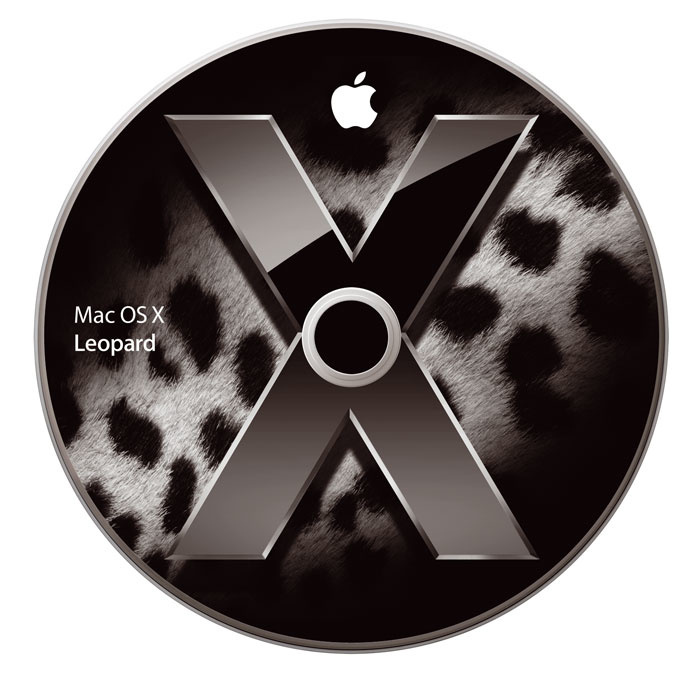 The first big change in Leopard is that Mac OS X will now be a completely 64-bit capable operating system. Although there's been 64-bit support in OS X since Panther, this has been limited to command-line-driven applications that don't make full use of Apple's frameworks, such as those used by developers to create graphical user interfaces. If you wanted to create a 64-bit application with a user interface, you'd have to first make an 'engine' 64-bit application that communicated with a separate 32-bit 'user interface' application, which wasn't particularly elegant. And, even then, this workaround was only applicable to Carbon applications: it was impossible to develop 64-bit Cocoa applications, for example. Leopard changes all this. Best of all for users, managing 32- and 64-bit applications will be as easy as managing Power PC and Intel-based applications is today. One application package can contain 32- and 64-bit versions for both Power PC and Intel architectures, and, as with Tiger today, 64-bit capable systems will still be able to run 32-bit and 64-bit applications side by side, without any performance loss due to emulation or translation (as in the case of the Rosetta translation technology). With its 1U form factor, Apple's Xserve has always been an intriguing possibility for Mac-based musicians and audio engineers. Now, with the introduction of an Intel-based model featuring built-in graphics and a similar architecture to the new Mac Pro, you may start seeing these in more studio machine rooms.This is useful, especially since there are many 64-bit-capable G5-based iMacs and Power Macs already out there already, and both the Mac Pro and new Xserve also feature 64-bit-capable processors. As mentioned in last month's Apple Notes, Intel's new Core 2 chip, which is expected to find its way at some point into Apple hardware currently using the original Core chip, will also be a 64-bit-capable processor. The second new feature that Apple have been talking about is Time Machine, a new tool that makes sure all of the files on your system are backed up appropriately. Once a backup drive has been specified, Time Machine works invisibly in the background and carries out 'point in time' backups every time you change a file on your system. The reason why this feature is called Time Machine is partly the innovative user interface Apple have created for it, which takes over the whole screen and allows you to flip through different versions of the current Finder window at various points in time, until you find what you're looking for. There's also a handy feature that gets Time Machine to automatically scan back through the system to find the point at which the Finder window differs from its current state. Third parties will be able to take advantage of Time Machine via an SDK (Software Development Kit). Casanova showed me the demos from the WWDC, which included retrieving a contact deleted from Address Book and a roll of photos deleted from iPhoto, by activating Time Machine with the relevant application in focus. And instead of showing Finder windows, Time Machine showed Address Book and iPhoto at various points in time, which is handy, since you can find your missing data in the context of the appropriate application, rather than having to wade through your User folder. There are, of course, many questions regarding the use of Time Machine, such as what happens when your backup drive gets full. Casanova explained that Apple are still working through a number of 'what if' scenarios, and that not every detail has yet been fully worked out, which is fair, considering that this is a preview release. I was also curious to know how closely Time Machine could integrate with applications such as Logic Pro, imagining being able to search for past arrangements in the same way as finding missing Address Book contacts, but Casanova was quick to point out that Time Machine is oriented towards backing up file-based data rather than being a replacement for Undo and other application-specific operations. 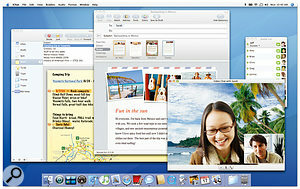 While the finished version of Boot Camp, the Apple technology that allows an Intel-based Mac to boot Windows XP, won't be available until next year with the release of Leopard, the public beta was recently updated to include a collection of new features that solve many of the issues users had with the original release. Boot Camp 1.1 offers support for the latest Intel-based Macs, including the recently released Mac Pro, and allows Windows XP to be installed on any drive available to the system — not just the start-up disk, as with the previous version. Built-in iSight cameras and microphones are now supported, and you can now right-click by clicking with the right-hand Command key held down, which is handy for Macbook and Macbook Pro users. Boot Camp 1.1 is available from Apple's web site (www.apple.com/bootcamp), and is over twice the size of the original release, weighing in at 202MB. A fast connection is recommended. If you're like me, I'm sure you tend to run many applications at the same time. Even as I'm typing this article I have 12 running, and while we all know it's better not to run too many applications alongside music and audio tools, I'm sure we're all guilty on occasion. Exposé made it easier to find the window you were looking for on your desktop, but a new feature in Leopard called Spaces (already a popular concept in the UNIX world) creates multiple workspaces. Spaces basically gives you multiple desktops — so you could use one Space for your music and audio apps, another for Mail and iCal (for example), and so on — and then makes it easy to switch between them via a simple keyboard shortcut. Here you can see the updated Mail and iChat applications in Leopard. Also notice the Time Machine and Spaces icons in the dock next to the Finder icon.Following on from the Core Audio and MIDI technologies we're all familiar with, and the Core Image and Core Video technologies introduced in Tiger for image and video processing, Leopard includes a new Core technology called Core Animation. Core Animation is a layer-based animation engine that makes it easy for developers to incorporate complex animations in their applications. Apple have already made use of the technology in creating the user interfaces for Time Machine and Spaces. One particularly impressive demo I saw was a recreation of the recent iTunes commercial where a city was built out of CD covers, using Core Animation. However, I doubt that this would run particularly well on Macs using embedded graphics hardware — Core Image-capable graphics hardware is required to run Core Animation. I asked Casanova about changes to Core Audio in Tiger, but he just smiled: since Apple don't comment on anything that hasn't been announced already, we'll have to wait on this one! 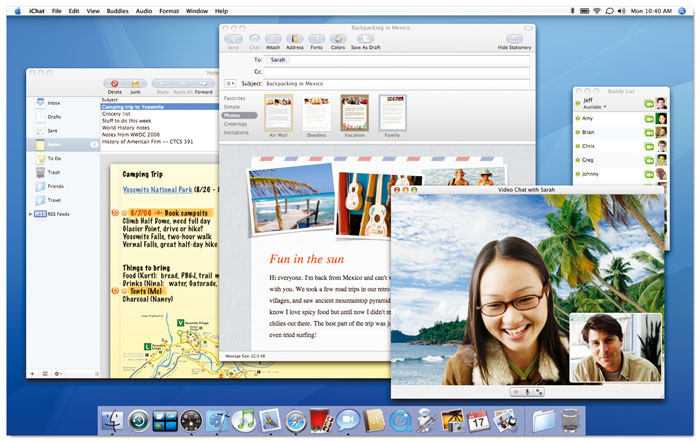 There are many other features in Leopard that are being talked about, though, such as an improved version of iChat that provides many special effects, the ability to make presentations, and a neat way for both participants in the chat to share and remotely control a single desktop. A new version of Mail includes the ability to store notes that are automatically synchronised with .Mac, which means no more having to email yourself with important things to remember. Dashboard settings can now be synchronised across multiple Macs via .Mac, which is great for those of us who want similar environments on our laptops and desktops. Spotlight has also been improved. Last, but not least, Leopard will also include the final release version of Boot Camp (see 'Boot Camp 1.1' box), as well as Photo Booth and the next generation of the Front Row media software, which were both previously only available with certain Macs. A final announcement from WWDC is that Apple have reduced prices across their Cinema Display line, so you can now purchase the highly desirable 30-inch display for just £1549. The 20- and 23-inch models are now available for £529 and £779 respectively.